Vastu Purusha was a demon who was pinned down on earth by the Devas (Demi – Gods) and is today present in all plots. Each god is the ruler of the point where he holds the demon down. Thus the north is ruled by Kubera; South by Yama; East by Indra and West by Varuna. The center point of Vastu Purusha is held down by Lord Brahma. There is an interesting story in the Matsya Purana which narrates about the story of Vastu Purusha. Legend has it that during the fight between Lord Shiva and demon Andhaka a man was born from the sweat of Lord Shiva. This man later started doing Tapas and penance to please Lord Shiva. His Tapas was so intense that Lord Shiva appeared before him and asked him to ask a boon. The demon wanted Lord Shiva’s permission to eat the three worlds. Lord Shiva granted him the boon. But when he was getting ready to swallow the earth, the gods lead by Brahma pinned him down on to earth and each god held him from a side. The demon was angry at his boon not being fulfilled. So Devas said that from today onwards you will be known as Vastu Purusha and you will be allowed to change your direction once in three months as per traditional Hindu calendar. 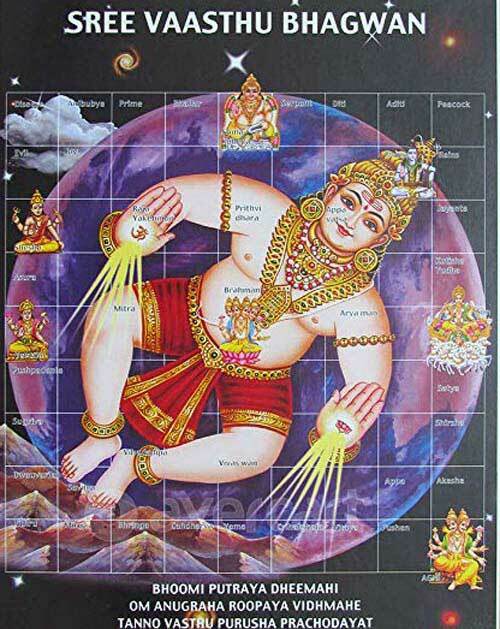 The Vastu Purusha is allowed to change his position once in three months during the Shukla Paksha Tritiya day. Vastu Purusha was allowed only to lie towards the left side. He was allowed to create trouble and devour those plots and houses that were built in the direction which the Vastu Purusha faced.